Well, it has been a really long time since my last post! I did not expect to take such an abrupt departure from blogosphere, but sometimes life (and gloriously warm, sunny spring days) does not leave time for reading and blogging. Or for sending out books to my blogiversary winners, which I promise I have not forgotten! One of the reasons I have not been blogging, besides the sunny weather and some upheaval at work, is this book. 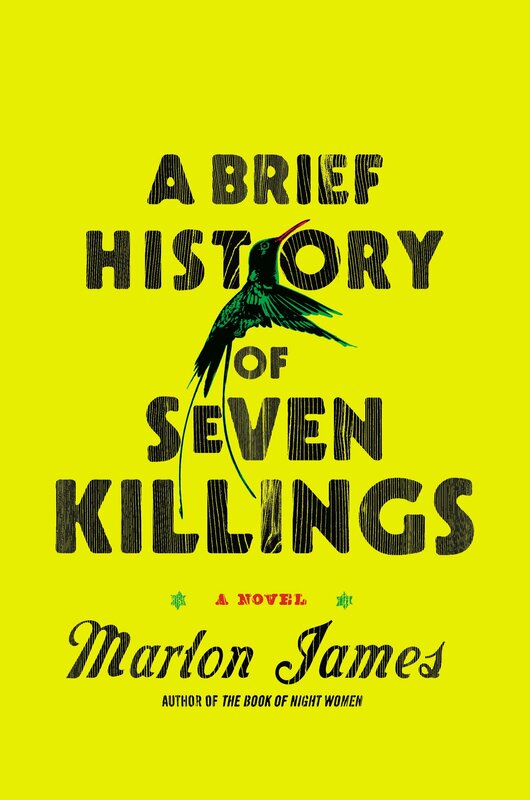 Marlon James' A Brief History of Seven Killings. This was my pick for the new book club I joined, and I only realized after the fact that it is like, 700 pages long, has about 15 different narrators, and is written is some seriously difficult to decipher dialect. I admit that I only finished this book because I spent so much time convincing the book club to read it. I would rate A Brief History of Seven Killings as, hands down, far and away, the most difficult book I have ever read. The book is set mostly in Jamaica, though later on, the action moves to the US. It focuses on the gang violence and culture that permeated every aspect of Jamaican life, and it makes clear just how difficult it is to escape that life, or to profit from it. There is also a plot to kill Bob Marley (the singer) and the repercussions of that for both the people involved and the people who witnessed the act. I think I probably understood about 25% of this book. I struggled mightily with the dialect and trying to keep all the narrators straight. One of the narrators in the book is actually a ghost, and I didn't even realize it until very late in the game. There's also a CIA agent, and I am still unclear on what his purpose in the story was. There were really only two narrators whose story arcs I completely understood. I really liked their stories and what James did with them, which is part of my frustration with this book. It was so dense and difficult for me to read, but the parts I did understand and follow were so well-written. So if I had been able to understand the rest of the book, I have a feeling it would have completely blown me away. But instead, I struggled for almost two months to get through it. There is a lot of showing, not telling, in A Brief History, which in a way I appreciate. I like that James expects his audience to be intelligent and familiar with what's going on. Unfortunately, though, I have zero working knowledge of Jamaican politics or current events, and just as little knowledge about the drug wars in 1970s-1980s America. So it was very difficult for me to understand the context of this book, which was maybe my ultimate downfall. Or maybe it was that there were SO many characters and I couldn't keep them straight. In addition to all this, there is SO MUCH VIOLENCE. I am not sure what seven killings James refers to in his title because there are way more killings than that in the book. Jamaica seems to be a pretty brutal place, once you get away from the resorts. The juxtaposition of the expat community and the local community was pretty jarring. Whatever the cause, I was utterly and completely lost through most of this book. But I made it all the way to the end and, truly, the end was very good. James pulls together all of his storylines (the ones I understood, anyway) and it is amazing. In some ways, I think it was worth the struggle to the end just for that feeling, but in most ways, I would rather have been reading something a little happier. Wow. Good on you for finishing it. I'm now very scared of it. You could very well understand it much better than I did, Heather! Awww. I tried reading this book, but put it down because of the violence, not the dialect. What made you decide to read pick this book for your book club over other ones? Yes, the violence was hard to take, I agree. I wanted to read it because it got so much critical acclaim and it sounded like something quite far out of my comfort zone. I really enjoy books with multiple narrators, most of the time, and people have such positive things to say about James' other book. Alas. I had no idea it was such a difficult book to read. i don't always do well with dialects. I think i still want to read it though, but I might put it off until i'm in the mood for a challenge! Definitely the sort of book you should read only if you're in the right mood! I recently heard about this book and it sounded sooo good! However, after reading your post, I'm glad I chose not to get it - sounds like I wouldn't have been able to even read it. How disappointing! Sorry, the book was a miss for you. I think it is a really good book, but it's difficult. Maybe get it from the library and give it a try? Even though everyone says this book is great, I slightly wonder if people are maybe a little bit suffering from Stockholm Syndrome by the time they reach the end. It sounds SO DARK and SO CONFUSING. Great explanation of why I sometimes rate a book higher for just getting through it. I hope your club has a great discussion! Our club has been known to select a substitute book when we find that everyone is bailing (mid month) but you don't yet know everyone's preferences, is that right?